Dylan works as a hairdresser, saving every extra penny to open her own shop one day. And at 25, it is a good dream to have. But learning that you have a twin sister is something that can throw your world into a spin if you are not careful. Cora is the twin sister, raised by a family with money and given every opportunity. She also has two brothers and both were adopted. While Cora wants to learn everything about Dylan and share her life with her, Dylan is finding herself being drawn to Cora's brother, Hunter. Hunter is the type of man that uses women, throws them away after he gets what he wants. And he wants Dylan, but he isn't sure what it is that is pulling them together. Can they spend one night together and not get burned? This story was a rollercoaster ride for me because Cora had my head spinning. She was all over the place, didn't understand or didn't care that Dylan had to work. Always wanting to go shopping, where Dylan hated it because she didn't have the extra money to spend. But I guess that is the difference between someone who grew up with money and someone who didn't. I loved the idea of this story, Dylan dated but didn't find the right guy. Then she finds him and he happens to be her long-lost sister’s brother, go figure. But the story is really good and will have you in tears by the end. I need book #2 NOW please. Dylan is a hard working woman who has a dream of owning and running her own salon someday. She scrimps and saves all of her money in the hope that this dream is on the horizon. When she works on an annoying bridal party, she is in for a major surprise... she's a twin and never knew. Cora is naive, selfish, somewhat annoying and endearing all wrapped into a twin package for Dylan. Cora grew up around money – a very different life than what Dylan grew up with. While Dylan never wanted for anything, both twins are so different. Then you have Cora's adopted brother, Hunter. Dylan and Hunter are pulled together by some unexplained attraction. You have some very steamy scenes and these two burn it up. But while you have their romance budding, you have family drama beckoning too. This book has a whirlwind of emotions stuffed into it. I loved that you never really knew what Cora was going to do, even though sometimes, it was annoying. I can't wait for book #2 and hope that it comes right away! I loved the premise of this book. A twin you didn't know you had and who seemingly won the lottery by being adopted into a wealthy family. Add in two adopted brothers and from the outside looking in, it seems to be a fairytale come true. I loved how the author wrote Dylan, how she isn't overwhelmed by her sister's money, her family's importance, and how she doesn't hold a grudge against her parents for giving Cora up for adoption. Still, Dylan struggles to find a niche in Cora's world, and it’s made even harder by her attraction to Hunter, Cora's adopted brother. As I finished part one of this book, I realized the old saying is true: Money can just about buy everything, but it can't buy happiness. I am a happily married mother of two beautiful (and trying) little girls. We have two German Shepherd pups (2 year old and 7 month old) that are constantly getting into trouble and keeping us on our toes. 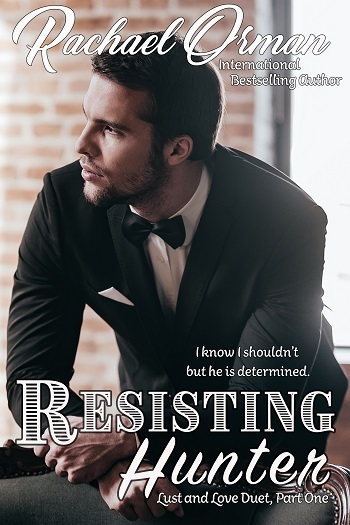 Reviewers on the Wicked Reads Review Team were provided a free copy of Resisting Hunter (Love and Lust Duet #1) by Rachael Orman to read and review for this tour.